Bringing the Snapdragon™ magic to the embedded market, the DART-SD410 supports the Qualcomm Snapdragon™ 410 (APQ8016) 1.2GHz Quad Cortex-A53 in 64-bit architecture. 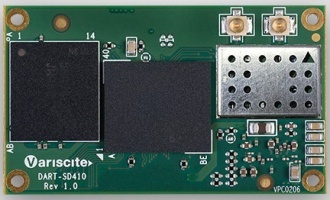 In an amazing 25mm x 43mm ultra compact size, the DART-SD410 offers a staggering processing power and highly optimized power consumption, ideal for embedded portable devices and battery operated products. High-resolution camera, advanced multimedia support and broad connectivity options are just some of the features that ensure a richer experience in various embedded segments and applications. * Register at the Variscite Customer Portal to get high quality engineering support for this product. This page was last modified on 25 February 2019, at 03:51. This page has been accessed 39,374 times.